The Southwest Anasazi are divided in two geographical areas centered around the four corners area of Utah, Colorado, New Mexico, and Arizona. The eastern area is the western slope of Colorado and the Chaco Canyon area of northwestern New Mexico. 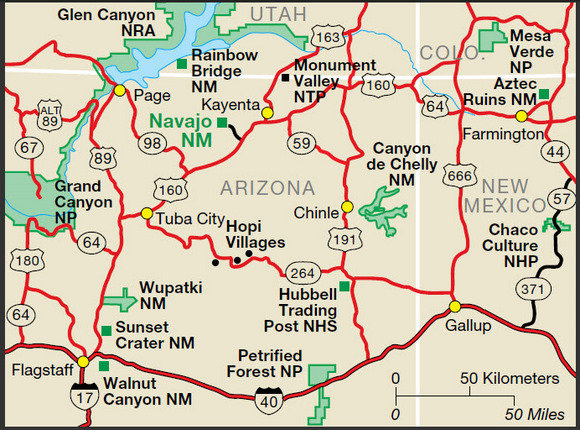 The western area is northeastern Arizona and the Virgin River drainage of southwestern Utah and northwestern Arizona. 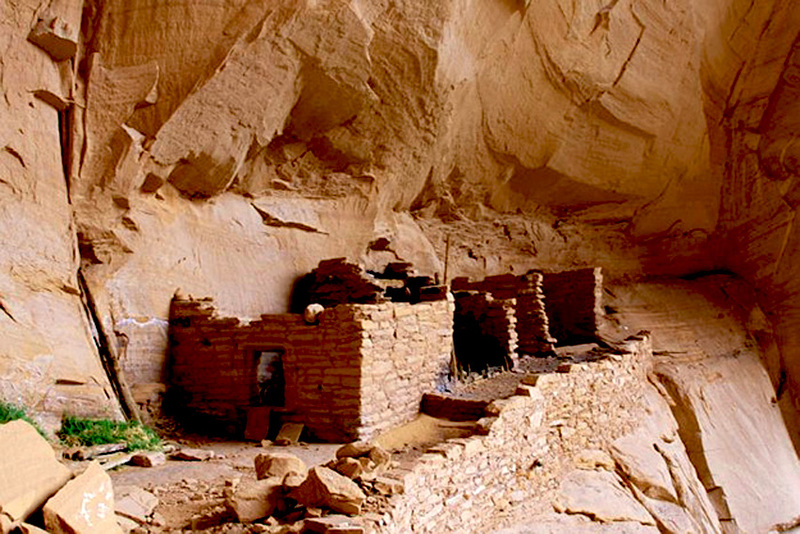 The western area Anasazi are generally referred to as the Kayenta Anasazi. 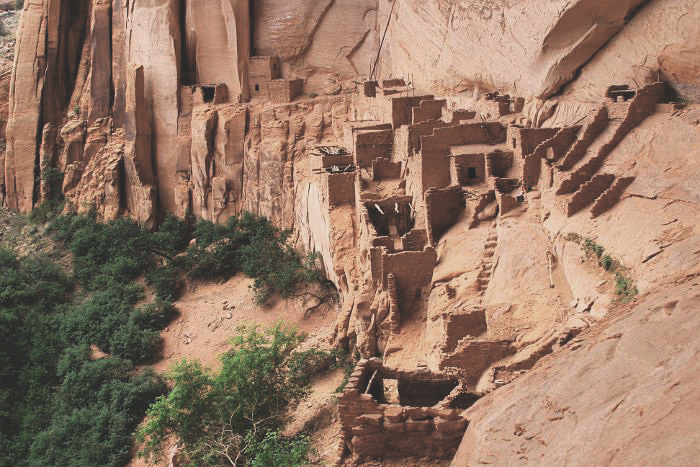 Between eleven and twelve hundred A.D., the Southwest Anasazi began to aggregate into large villages located on mesa tops, Hovenweep, and in large alcoves just below the mesa tops, Mesa Verde. The move into these remote isolated areas was not by choice…but by necessity. The myth of the Southwest Indians being a peaceful agrarian people is being dispelled by many archaeologyical findings over the last several years. Stephen Lekson, A History of the Ancient Southwest, and Christy Turner, A. Man Corn: Cannibalism and Violence in the Prehistoric American Southwest documents Southwest Indian sites with evidence of violence, warfare, and in some cases cannibalism. As with everything else, there is wide disagreement between archaeologists, activists, and many Pueblos over Lekson and Turner’s conclusions. 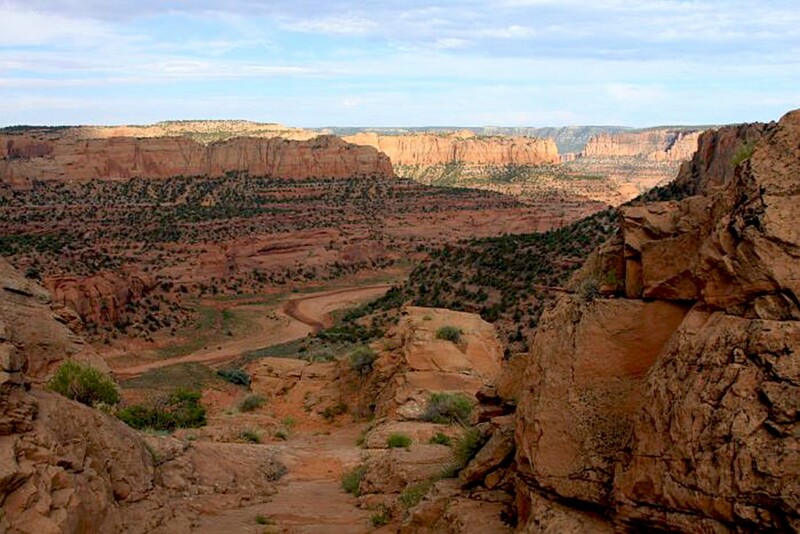 President William Howard Taft created the Navajo National Monument in 1909. 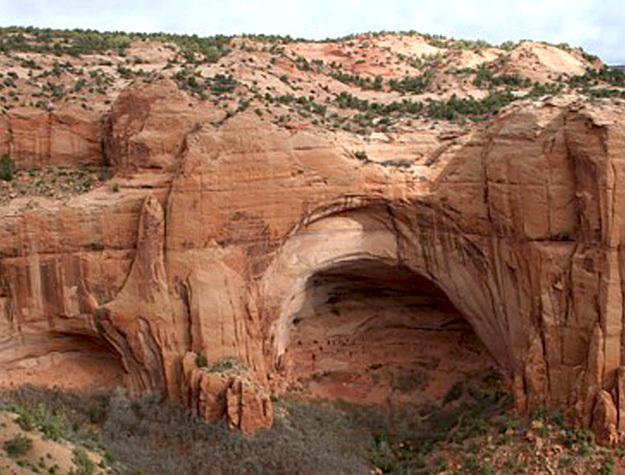 The Navajo National Monument is southwest of Kayenta, Arizona, on highway 160…exit at AZ 564. 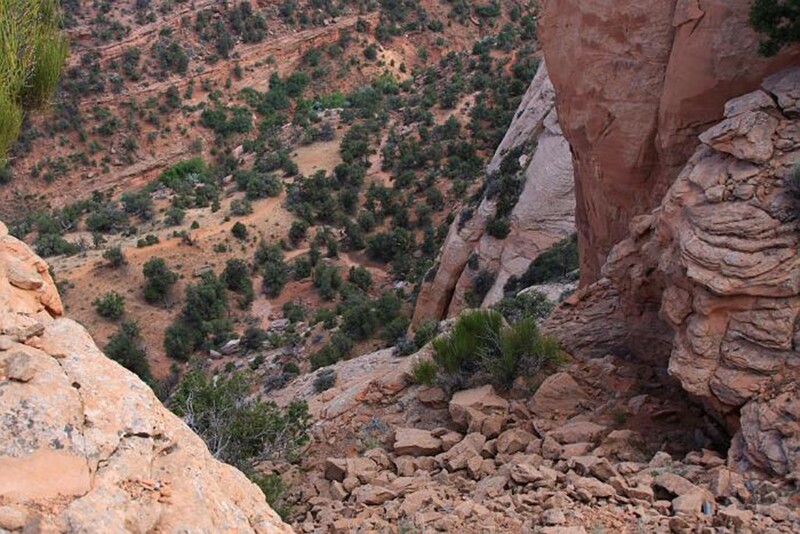 The Navajo National Monument features a visitor center with a museum, two short self-guided trails, two campgrounds, and a picnic area. The guided tour to Betatakin and the campgrounds are free…from the campground to the tour guide, this is a true gem in the National Park Service system, and it is all free. 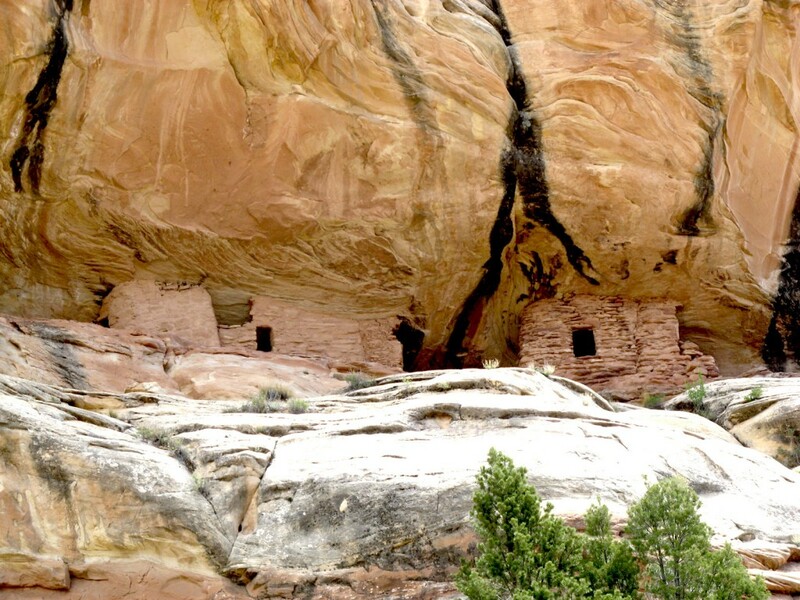 The Navajo National Monument consists of three Anasazi (Hisatsinom, Ancestral Puebloan) cliff dwellings: Betatakin, Kiet Siel (Keet Seel), and Inscription House; Inscription House is closed to public access. 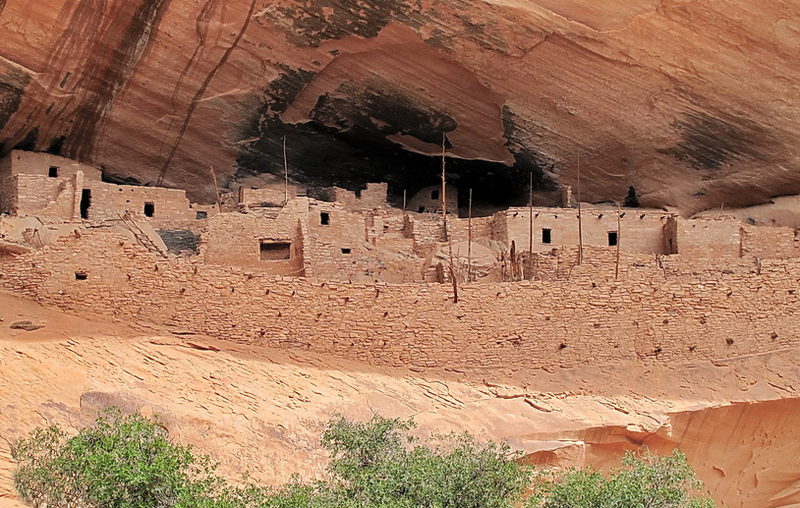 The Anasazi of this area based their subsistence on agriculture. The primary crops were maize (corn), beans, and various types of squash. In addition to agriculture products, the people of the Tsegi Canyon system hunted wild game. 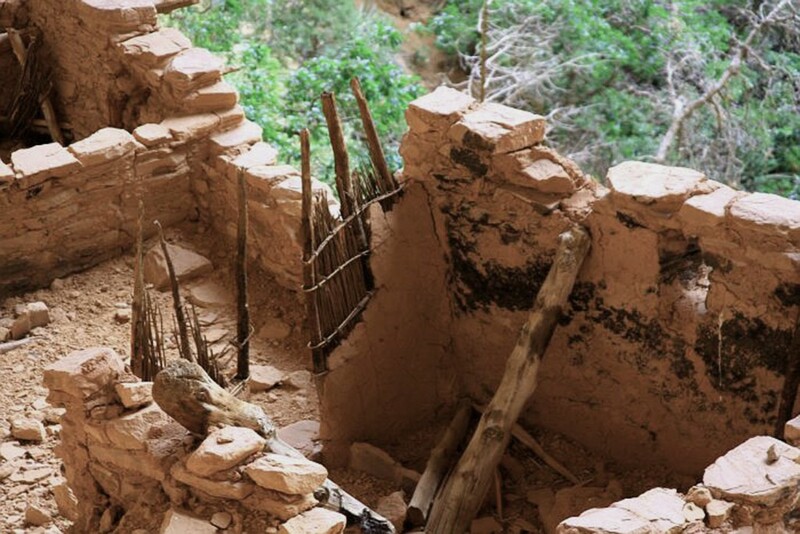 The cliff dwellings in the Navajo National Monument were built in the mid-twelve hundreds and abandoned by the early 1300s A.D.. A lack of sufficient agriculture land in the canyon floor, coupled with a prolonged drought, limited the land’s capacity to support a growing population in the cliff dwellings. In the Hopi language Betatakin means Talastima, or “Place of the Corn Tassel”. Built between 1267 and 1286 A.D., Betatakin was constructed in an enormous alcove measuring four hundred and fifty-two feet high and three hundred and seventy feet across. 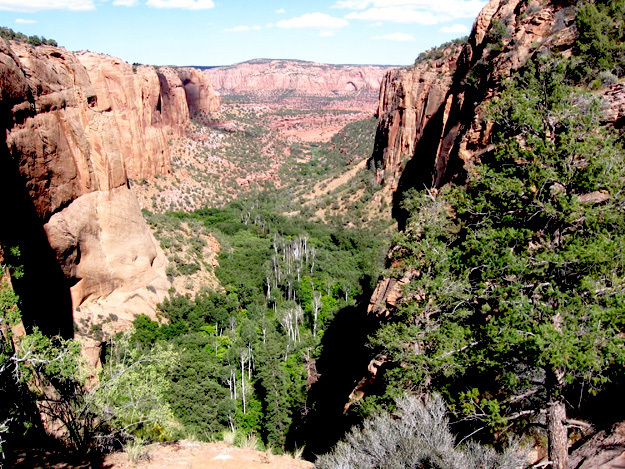 From the Navajo National Monument visitor center, the four hour guided tour to Betatakin is a five-mile round-trip hike. There is a seven hundred foot descent into the canyon, which means there is a seven hundred foot climb out of the canyon. The hike is classified as strenuous by park officials. At its peak, Betatakin consisted of one hundred and twenty rooms formed into twenty clusters and one kiva. 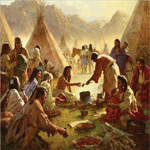 Betatakin’s population was an estimated one hundred and twenty-five people. On a ledge above the major portion of the ruins is a stone-blocked wall with another set of stone dwellings. This ledge with its structures served as a place to escape from raiding parties, and to store an emergency source of food. The only access to the upper level is up the long pole in the background of the above picture. The Betatakin dwellings were constructed with sandstone blocks. There is evidence that a number of structures were built at the base of the alcove. Inhabitants of Betatakin utilized household debris to widen the cave to increase habitable space. Unprotected by the overhanging alcove, these structures were exposure to weather and soil erosion. Jackal walls are evident in the construction of Betatakin. The walls of a Jackal were made from small upright wooden poles plastered together with mortar. The mortar used was an equal mixture of clean sand and thin red clay layer beneath the massive Jurassic sandstone of the surrounding cliffs. Falling rocks breaking off from the alcove roof have destroyed all but eighty rooms and the kiva at Betatakin. 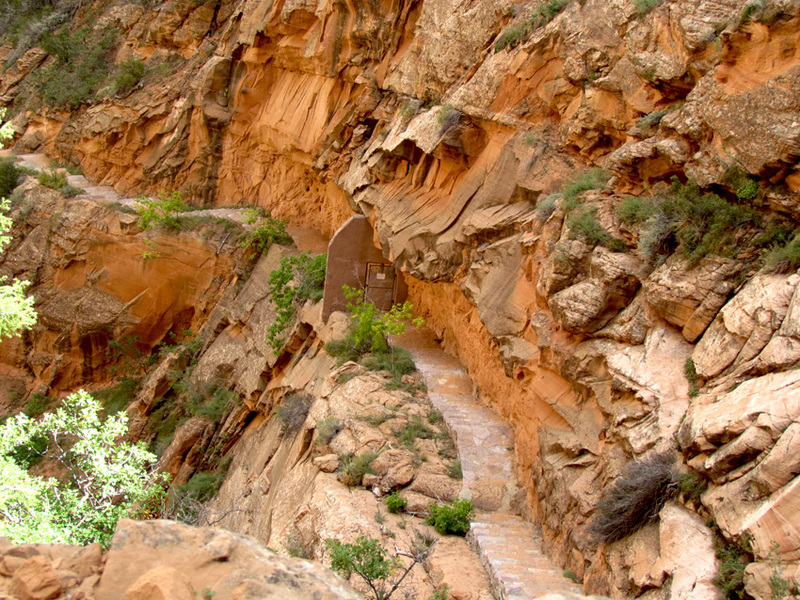 The closest source of dependable of water was a mile below the Betatakin cliff dwelling. Laguna Creek provided water for the stone-tooled inhabitants of Betatakin and for the growing of maize, beans, and squash…the Three Sisters. Betatakin had a large number of storage rooms suggesting a surplus of agricultural crops, at least in the beginning…it is of historical interest to note the Old Spanish Trail followed Laguna Creek through this area. Betatakin was abandoned in the late twelve hundreds shortly after being built. The Kiet Siel hike requires a backcountry permit, and is limited to twenty people per day. The seventeen mile round-trip trail drops a thousand feet and then climbs up to the Kiet Siel ruin. During the warmer months, hikers can stay overnight in a designated campground near the Kiet Siel ruin. Dry conditions and protection from the elements at Kiet Siel have preserved the architectural structures and abundant artifacts. Kiet Siel is considered by many archaeologists to be the best preserved ruin in the American Southwest. The Kiet Siel site was first occupied in the mid-1200s. New construction continued at Kiet Siel until around 1280 A.D.. At the peak of its growth, one hundred and fifty people inhabited Kiet Siel. Kiet Siel was abandoned by the early 1300s. Jonathan Haas of the Field Museum in Chicago proposed the major reason to move into the high mesa canyons was defense against marauding enemies. His belief was Indians from small isolated communities raided the cliff dweller’s food supply, and in the twelve hundreds, internal conflict and warfare became common. 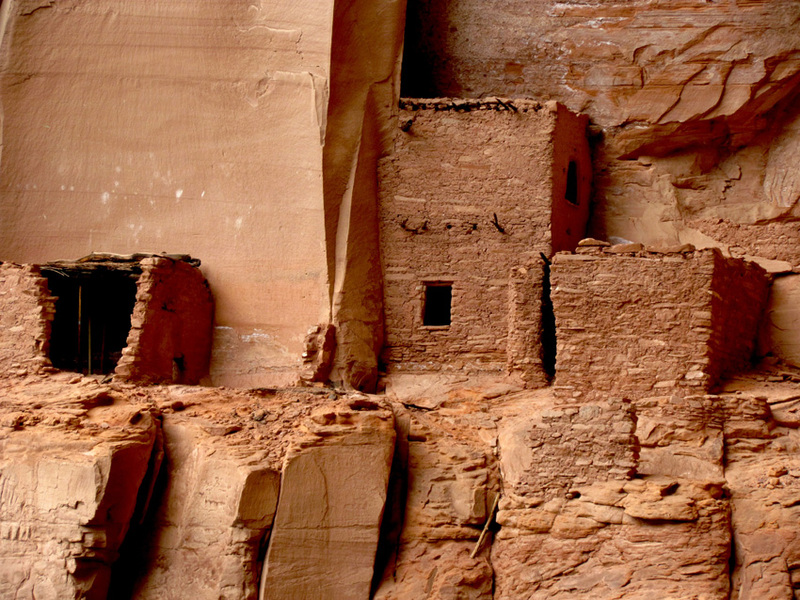 Regardless of the reasons, by the end of the thirteenth and early fourteenth centuries, the Southwest Anasazi abandoned the cliff dwellings and mesa tops. The Kayenta Anasazi moved primarily to the Hopi villages on the three mesas. The Mesa Verde Anasazi migrated to the Zuni lands in western New Mexico, and to the Pueblo villages along the Little Colorado and Rio Grande rivers in Arizona and New Mexico. The Betatakin article was written by Ned Eddins of Afton, Wyoming. Permission is given for material from this site to be used for school research papers. Citation: Eddins, Ned. (article name) Thefurtrapper.com. Afton, Wyoming. 2013. There have been many requests for copies of pictures from the website. The best website pictures, and others from Jackson Hole, Yellowstone, and Star Valley, Wyoming, have been put on a CD. The pictures make beautiful screensavers, or can be used as a slide show in Windows XP. When ordering Mountains of Stone, request the CD and I will send it free with the book. The Winds of Change CD contains different pictures than those on the Mountains of Stone CD. To view a representative sample of the pictures click on the CD picture. To return to the Home Page click on Fur Trapper logo. Barnes, F. A and Pendleton, Michaelene. Canyon country prehistoric rock art: An illustrated guide to viewing, understanding and appreciating the rock art of the prehistoric Indian cultures of Utah, the Great Basin and the general Four Corners region. Wasatch Publishers, Salt Lake City, Utah. 1989. Cordell, Linda S. Ancient Pueblo Peoples. Smithsonian Books, Washington, D.C. 1994. Diamond, Jared. Guns, Germs, and Steel: The fates of Human Societies. W.W. Norton, New York, N.Y. 1996. Dillehay, Thomas D. The Settlement of the Americas. Basic Books, New York, NY. 2000. Ferguson, William M. and Rohm, Arthur H. Anasazi Ruins of the Southwest in Color. University of New Mexico Press. 1990. Frazier, Kendrick. People of Chaco: A Canyon and its Culture. W. W. Norton, New York, NY. 1999. Koppel, Tom. Did They Come By Sea? American Archeology Magazine, Spring. 2002. Lekson, Stephen. A History of the Ancient Southwest. School for Advanced Research Press. Santa Fe, New Mexico. 2011. Madsen, David B.. Exploring the Fremont. Utah Museum of Natural History/University of Utah, Salt Lake City, Utah. 1989. Noble. David Grant. Archeology Guide to Ancient Ruins of the Southwest. Northland Publishing, Flagstaff, AZ, 2000. Schaafsma, Polly. The Rock Art of Utah. University of Utah Press, Salt Lake City, Utah. 2004. Stone, Tammy. The Prehistory of Colorado and Adjacent Areas. University of Utah Press, Salt Lake City, Utah. 1999. Taylor, Allan. American Colonies: The settling of North America. Penguin Books. New York, NY. 2002. Turner, Christy G. II , and Turner, Jacqueline A. Man Corn Cannibalism and Violence in the Prehistoric Southwest. University of Utah Press, 1999. Walker, Paul Robert. The Southwest Gold Gods & Grandeur. National Geographic Society. 2001. Warner, Ted J., Ed. The Dominguez Escalante Journal – Their Expedition through Colorado, Utah, Arizona and New Mexico in 1776. University of Utah Press. Weber, David J. The Taos Trappers-The Fur Trade in the Southwest 1540-1846. University of Oklahoma Press. 1982. Wenger, Gilbert. The Story of Mesa Verde National Park. 1980.